On October 22nd, 2012 at 8 AM a tropical depression developed in the Southwest Caribbean Sea, about 305 miles south-southwest of Kingston, Jamaica. Approximately 6 hours later, this depression became a tropical storm and Sandy was born. From there, Sandy tracked northward, striking Jamaica, Cuba, and the Bahamas with Category 3 winds of 115 MPH at its peak. In addition to its intensification, Sandy rapidly grew, nearly doubling its original size by October 26th. By October 27th, all eyes were on Sandy as it continued to drift northward in the Atlantic before making an abrupt turn left, directly at the New Jersey. Even before this sharp turn, the Northeast was already feeling the effects from the storm, “with the persistent onshore winds well ahead of the storm and astronomically high tides, coastal flooding began some 48 hours before the storm ever made landfall" states Meteorologist Rob Reale. As the time of landfall drew closer on October 29th, surge increased, heavy rain began, and hurricane force winds overspread the area. At its peak, wind gusts of up to 80 - 90+ mph were reported from Massachusetts to Pennsylvania and every in between (click here for wind damage photos). In fact, tropical storm force winds from Sandy covered up to 1000 miles of the Eastern Seaboard (see above) - from South Carolina to Maine! Rainfall totals surpassed 10 inches in parts of southern New Jersey and Maryland with over 30 inches of snow falling in portions of West Virginia and Tennessee. 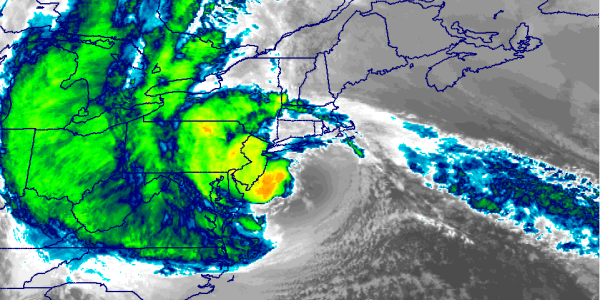 While the wind, rain and snow reports are astounding, the most devistating aspect of the storm was the record surge as this massive storm moved ashore. Meteorologist Matt Gillen explains,"It’s nearly 90 degree left turn aimed Sandy squarely at the southern New Jersey coast. This unusual track, coupled with Sandy's size and strong winds pushed an incredible amount of water toward the coast. We may never see a hurricane take a track like this again in our lifetimes." New Jersey endured some of the worst of Sandy, with storm surge and battering waves devastating large portions of the coastline. In fact, the extent of catastrophic damage was unparalleled in the state’s history. Whole communities were inundated with water and sand, houses were washed from their foundations, boardwalks were dismantled or destroyed, not to mention cars and boats were tossed about like toys. Approximately 5 million people lost power across the state, with outages commonly lasting for one to two weeks. The New Jersey’s Governor’s office estimates that 346,000 housing units were damaged or destroyed across the state. In Seaside Heights, NJ, even the iconic vacation spots like the Casino and Funtown Piers were decimated. Long Beach Island was dealt the brunt of Sandy, with nearly every ocean side house extensively damaged or destroyed. Furthermore, the rail operations center of the New Jersey Transit Authority in Kearny was flooded by up to 7 feet of water, damaging as many 74 locomotives and 294 rail cars; several weeks passed before rail services resumed. Overall damage estimates to the New Jersey transit system are around $400 million, with estimates of total damage to the entire transit, road and bridge system reaching $2.9 billion. Preliminary U.S. damage estimates are near $65 billion, which is second only to Hurricane Katrina's $100+ billion. There were at least 147 direct deaths recorded across the Atlantic basin due to Sandy, with 72 of these fatalities occurring in the mid-Atlantic and northeastern United States. During a recent survey, WeatherWorks meteorologists were asked if they had ever experienced a storm of Sandy's magnitude before. Nearly all surveyed answered with a resounding “No”—they had never seen a storm like Sandy before in their lifetimes. The President of WeatherWorks, Frank Lombardo, who has over 30 years of forecasting experience agreed, saying, “Sandy is the worst storm to affect New Jersey that I remember; it had perfect storm attributes. It just all came together at the worst possible time”. When questioned about what he learned from Sandy and what he would do differently next time, WeatherWorks meteorologist Ken Elliott stated, “I learned that occasionally the worst case scenario can, and does happen. From a personal standpoint, I prepared as much as possible--filled up the gas tank, prepared for power outages etc… Next time I will more strongly urge others to take such precautions”. Hurricane Sandy will long be remembered for the devastation and destruction suffered along the East Coast. Sandy was a near worst case scenario for coastal regions of New Jersey north to Connecticut. In fact, new research from a senior scientist at NASA Goddard Institute for Space Studies, Timothy Hall, indicated Sandy was likely a 1 in 700 year storm, due to it's strength and rarity of its track. However, this does not mean we can let our guard down, if a storm of Sandy’s magnitude can happen once, it can certainly happen again. Hopefully by studying this storm and improving our knowledge of weather phenomena, it will allow the scientific community to better recognize and prepare for when the next natural disaster strikes. (Above) Before & after aerial photographs of Mantoloking NJ. View looking west along the New Jersey shore. Storm waves and surge cut across the barrier island at Mantoloking, NJ, eroding a wide beach, destroying houses and roads, and depositing sand onto the island and into the back-bay. Construction crews with heavy machinery are seen clearing sand from roads and pushing sand seaward to build a wider beach and protective berm just days after the storm. The yellow arrow in each image points to the same feature. Photos from the USGS.